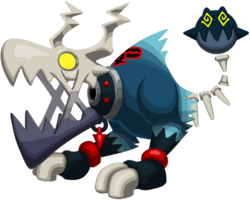 The Living Bone is an Emblem Heartless that was introduced in Kingdom Hearts II. Living Bones sometimes have Shamans riding on them. This forms a powerful relationship—the Living Bone's strength and the Shaman's magic make it even more intimidating. If a Living Bone is defeated while a Shaman is riding it, the Shaman is destroyed along with it. In the Elephant Graveyard, two Living Bones chase Nala while she's scavenging for prey. However, Sora, Donald and Goofy come to Nala's aid and defeat the two Heartless. The Living Bone resembles a large, blue-skinned dinosaur with two short, navy blue legs, each of which has two large, white claws and a red anklet. Its tail is thin and appears to have decayed, leaving only bone segments. The tip of its tail is a large, spherical shape that is navy blue with a wide, jagged, black "mouth", yellow, spiral "eyes", and two short "arms" on it. The Living Bone's head is also skeletal, sporting horns, glowing, yellow eyes, and large, sharp teeth. Its lower jaw is dark blue, and the rest of its skull is white. It also wears a thick, black collar with teal edges and red bumps lining it. A short, silver chain ending in a red, pyramidal weight hangs from the collar. It is reminiscent of an ankylosaurus due to its body structure, particularly its clubbed tail. Its Heartless emblem is on a large hump on its back. 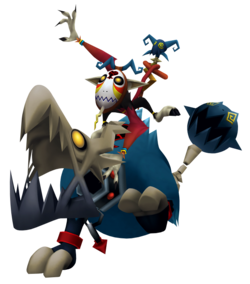 In Kingdom Hearts II Final Mix, the Living Bone's body is predominantly tan, its legs are blue, its anklets are gold, and its claws are grey. Its tail bones are brown, and the weight on its tip is navy blue with a red "lower jaw". The Heartless's skull is now brown with an orange lower jaw, and its collar now has red edges and yellow bumps lining it. The small weight at the end of the chain is also yellow. The Living Bone's name reflects how it is still "living" despite its skeletal appearance. Jumping Shockwave: Leaps and causes a shockwave upon landing. Spinning Tail: Spins and strikes with tail. Blaze: Blue fire appears at target's feet. Will-O-Wisp: Six will-o-wisps circle Sora. Shake Off: Shakes Sora off and tail-lash. Living Bones are powerful enemies that deal significant damage, so Sora should attempt to fight them while staying in the air; such as by using Magnet, Thunder, and aerial combos. Reflect can also be exploited to use their strength against them. 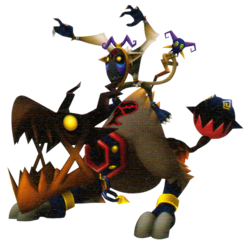 Outside of the Underdrome, Sora in his Lion form can also use the "Rodeo" and "Grand Cross" reaction commands to decapitate them, weakening them significantly. If a Living Bone with a head and Shaman spawn separately, then the Shaman will teleport itself onto the Living Bone and ride it if given the chance.